Every year we look forward to the Voronkov camp. Both of the years we were back in the States, Mary travelled back here to participate. We have been looking forward to it since we returned in January. Planning for it began several months ago and so much went into it. The Voronkov camp is always an opportunity to meet new moms (and this year, dads) and their children. The focus of the Voronkov camp is non-believers. This year we had almost all non-believers both weeks of camp. This year, there was a total of 41 families! We would say that these types of camps are the hardest emotionally and spiritually. However, they are SO IMPORTANT. The first week, we had some very closed campers. We began the week unsure of how or if we would be able to reach them. However, as the week went on, even the most closed became more open. I can’t give detailed information here because I don’t want to undermine any progress we have made in people’s spiritual journey. But, I can tell you that by the end of the week, we had a couple of the most resistant to the Gospel and the reality of God tell us that they saw in us (the leadership team) that we obviously really believed all this stuff we had talked about. Several have said that they plan to at least try the Friday night Bible study when it starts again. We are also exploring with Tonya the possibility of starting a second Friday night group that would be for those who are farther away from a relationship with the Lord. We are praying and thinking and talking. Join us in praying about that. Our them both weeks was “The Way with the Lord.” The fun part of the theme was that we were on a train trip throughout Ukraine. We “visited” Brovary, Kyiv, Odessa, L’vov, Ternopyl, and Poltava. Each day we focused on one of Jesus’ “I Am” statements. (I Am the Bread of Life, I am the Light of the World, I am the Door, I am the Good Shepherd, I and the Way, the Truth and the Life, and I am the Resurrection and the Life.) We got up close with the Savior and how He can and wants to relate to us in our daily lives. The theme left many of the participants with lots of questions that we got to talk about during free times. One of the Americans (Carol) who comes each year with Bill Heaton’s group from Berean Baptist Church taught a deeper study of each days theme. The moms are not required to attend, of course. They are adults and can decide for themselves. However, with very few exceptions, all the moms were in each study. They enjoyed digging deeper into God’s Word and received it. Carol used very interesting personal experiences to illustrate her classes and really encouraged the ladies to make God’s Word part of their lives. Both weeks we were able to give out Bibles to the moms and “The Jesus Storybook Bible” in Russian and Ukrainian. This is a beautifully illustrated book with easy to understand versions of several dozen Bible stories. One mom came up to me and said that her son has never wanted to read the Bible at all and that for the first time he wanted to read it. He also wanted to try reading the story in the Bible and not just in the storybook Bible. Many of the parents also told us that they were reading the stories and were understanding for the first time. God’s Word is so important and we are glad to be able to provide it. It’s God’s Word that has the power to change people. Both weeks, we had many children with varying levels of Autism. I won’t comment on any of the children or any specific behaviors, but most of these kids have never been with someone besides their parent so it makes it hard on everyone. By the end of both weeks, everyone settled in, though. During the week, there was a memory verse each day on the theme. Each verse they memorized gave them more “money” to spend at the carnival and sale on Saturday. This is a highlight of the week and the ability to buy more gave them incentive to memorize. And they DID memorize. Most of the parents and many of the kids memorized six “I Am” verses. This is of major importance. Maybe they mostly did it to get something on Saturday, but God’s Word never returns void! The second of week of camp was programmatically exactly like the first week. However, one major difference from any of the past six years was that there were three dads who came and stayed. We had the first ever dad’s class while the moms had their class. I honestly expected them to be closed and to not even come. How wrong I was. I don’t feel like I can give details here, but let me ask you to pray for them. And pray for me (Chris). I have opportunity to meet with them and continue to speak truth. I’m excited about it, but also nervous. While we are able to communicate in Russian, talking about Spiritual things is much harder because of the very different vocabulary and sentence structures. We are still in the infant stages of learning those things. I won’t say anymore about the dads except that it was thrilling to see how the Lord is working in their hearts and I am so excited at the future with them. On each of the Saturdays, we brought our whole family with us. Many of the moms both weeks told Tonya what a heart changing moment it was to see us all together and to see that the things we had said in our testimonies were visible to them when we were all together. They told Tonya that it is so important that we are here. Here me correctly, here. There isn’t really anything about us that is special – it’s the Lord working through us and the makeup of our family that is impactful. We often feel so useless here and that we are not accomplishing anything. However, these weeks at camps, we heard from the very people that we want to minister to that it matters that we are here. It was a real boost to our faith and we want to thank those of you who make it possible for us to live here – both financially and through your prayers. It matters. Your support matters. You are part of this! Thank you. We were excited to have two guests with us from First Moore participate in the Voronkov camps. Alex Robison decided several months ago to come and us he Music Therapist skills at the camp. And just a few weeks before the trip, Mary Hanson found it possible to come and participate, as well. She agreed to be a volunteer at camp for Micah and Eliana so they could come to camp and participate. 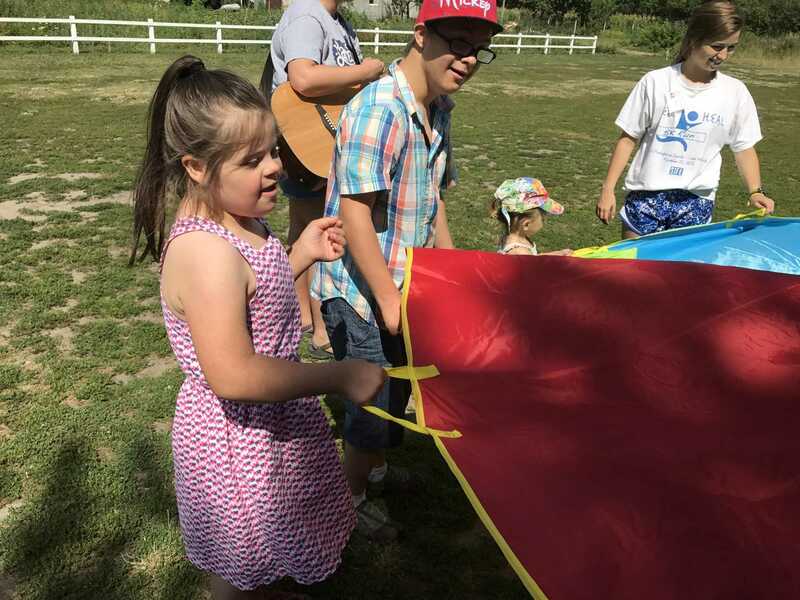 That was a huge blessing for us because we haven’t been able to have our kids participate in camp because if they did, we would spend all our time with them and would not be available to connect with the parents. Having them at camp was very special. Watching Alex with even the hardest kids was magical. Again, I won’t comment on specific kids or their issues, but some of the kids that were basically unreachable were reached by Alex’s interaction with them. It was just wonderful. Thank you to those who supported her work here. Seeing the moms and dads gradually open up to communicate honesty with us regarding spiritual things. They were willing to share their joys and their struggles with us openly and allowed us into their lives. We look forward to all the follow-up! We began building a couple of dozen new relationships and we will have the opportunity to continue to build them in the coming weeks and months. This makes us really nervous for reasons I have stated before, but we trust God to give us the ability and the courage. The three dads who came and participated. Almost all the families were new at both weeks of camp. Incredible opportunity! We had real conversations about the Lord and how He wants to be part of the lives of the families. We have so much opportunity in the coming weeks with these dear ones. How can you pray for those at the Voronkov Camps? The many new relationships we began and the ability to cultivate those for the sake of the Gospel. For the three dads and the opportunity to continue to connect with them and lead them to the Savior. “S” as she begins her walk with Christ. The seeds of the Gospel were spread liberally and pray that the Spirit of God will water them and they will bear fruit. Pray for the team as we think about next year and all the details that need to be decided. We had a waiting list this year for both weeks and we want to consider ways to include more families next year. Thank you for supporting our family in prayer and financially. It’s because of you that we can be here and share the Gospel with the beautiful people of Ukraine. Enjoy these videos. There were two videos for each week. Please do not share these videos further than this post of the email newsletter.